This is where laughter comes in - when it becomes a choice whether to weep for the next four years or take a breath, take a respite, and watch the satirizing of the people who’ve decided which lives deserve rights and which matter most. The last few weeks have felt like a waking nightmare – particularly for those of us who have hearts and brains, and especially for those of us whose rights are in danger of being stripped away (if we even had any in the first place). We’ve seen the alt-right create “alternative facts” to push their agenda onto the American people and the world, ban people (refugees, visitors, citizens) from entering the country because of their heritage and religion, and we’ve seen rights hard fought for threaten to dissipate beneath the wave of a pen gripped in miniscule digits. Between wondering how we’re going to survive the next four years and feeling flabbergasted when others can’t see it (or won’t), or even gladly cheer the nefarious return of fascism, it’s a wonder we’ve enough sanity between us to keep it together and keep fighting. This is where laughter comes in – when it becomes a choice whether to weep for the next four years or take a breath, take a respite, and watch the satirizing of the people who’ve decided which lives deserve rights and which matter most. Saturday Night Live’s Oval Office Cold Open this past weekend was a welcome relief, as we saw Alec Baldwin return as No. 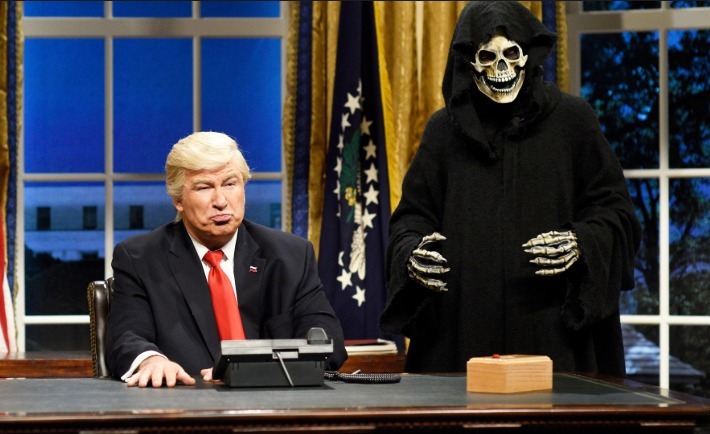 45, and Death’s appearance as Steven Bannon. Between them, they manage to make a few calls and arrange themselves a world war, until Zimbabwe flips the tables and threatens to return the favor. This used to be the job of a jester – someone who would poke fun at royalty to remind them that they were, at the end of the day, human like the rest of us, only they had been given more responsibility, which was not to be wielded lightly. It was also the job of the jester to tell the truth, and Saturday Night Live’s satirical take on No. 45 and his right-hand man reminds us that we’re dealing with incompetent, impotent men. SNL doesn’t have to stray from the truth to make fun of these people. No. 45’s repulsive actions on Holocaust Remembrance Day are now part of our history. His interactions with world leaders are spread across the world for all to see via social media (and his own private phone). His team’s agendas are no longer secret. Look at their histories and see what is to come. The Bowling Green Massacre gaff, the Frederick Douglass fiasco, the temper tantrums over building a wall, repealing bans, and appointments, and all the other horrific business that has been conducted since the end of January only goes to show that these people do not deserve power. They are irresponsible megalomaniacs who would, in a heartbeat, destroy the world to suit their own purposes. By laughing at them, by poking fun at them, by satirizing their idiocy, we are taking power from them, little by little. By standing up to them and holding them accountable, we are taking our power back bit by bit. By marching, protesting, donating, conversing with one another and with our leaders, we are taking back what belongs to us, piece by piece. If you haven’t been paying attention, now’s the time. Look at who is pulling the strings in this operation. Follow the money. And then make up your mind where your loyalties lie. We will not let these monsters follow in the footsteps of other men who destroyed their own countries. We will not let them take us backwards. We will not let history repeat itself. And while we continue to fight for equality for all of us, take a little time for self-care, and remember which side of history you’re on.